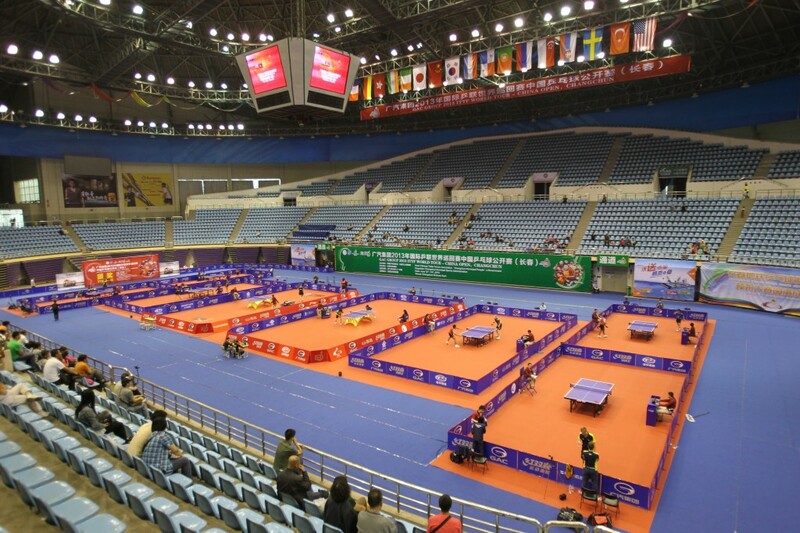 Here is the complete set of rules for the ITTF Rules/ Laws of Table Tennis. This set of rules will be updated after every ITTF AGM, to ensure that the rules are always current, making this a handy reference. 2.01.01 The upper surface of the table, known as the playing surface, shall be rectangular, 2.74m long and 1.525m wide, and shall lie in a horizontal plane 76cm above the floor. 2.01.02 The playing surface shall not include the vertical sides of the tabletop. 2.01.06 For doubles, each court shall be divided into 2 equal half-courts by a white centre line, 3mm wide, running parallel with the side lines; the centre line shall be regarded as part of each right half-court. 2.02.04 The bottom of the net, along its whole length, shall be as close as possible to the playing surface and the ends of the net shall be attached to the supporting posts from top to bottom. 2.04.03 A side of the blade used for striking the ball shall be covered with either ordinary pimpled rubber, with pimples outwards having a total thickness including adhesive of not more than 2.0mm, or sandwich rubber, with pimples inwards or outwards, having a total thickness including adhesive of not more than 4.0mm. 2.04.03.01 Ordinary pimpled rubber is a single layer of non-cellular rubber, natural or synthetic, with pimples evenly distributed over its surface at a density of not less than 10 per cm2 and not more than 30 per cm2. 2.04.03.02 Sandwich rubber is a single layer of cellular rubber covered with a single outer layer of ordinary pimpled rubber, the thickness of the pimpled rubber not being more than 2.0mm. 2.04.08 Before the start of a match and whenever he or she changes his or her racket during a match a player shall show his or her opponent and the umpire the racket he or she is about to use and shall allow them to examine it. 2.05.06 The free hand is the hand not carrying the racket; the free arm is the arm of the free hand. 2.05.07 A player strikes the ball if he or she touches it in play with his or her racket, held in the hand, or with his or her racket hand below the wrist. 2.05.08 A player obstructs the ball if he or she, or anything he or she wears or carries, touches it in play when it is above or travelling towards the playing surface, not having touched his or her court since last being struck by his or her opponent. 2.05.13 Anything that a player wears or carries includes anything that he or she was wearing or carrying, other than the ball, at the start of the rally. 2.05.14 The end line shall be regarded as extending indefinitely in both directions. 2.06.01 Service shall start with the ball resting freely on the open palm of the server’s stationary free hand. 2.06.03 As the ball is falling the server shall strike it so that it touches first his or her court and then, touches directly the receiver’s court; in doubles, the ball shall touch successively the right half court of server and receiver. 2.06.04 From the start of service until it is struck, the ball shall be above the level of the playing surface and behind the server’s end line, and it shall not be hidden from the receiver by the server or his or her doubles partner or by anything they wear or carry. 2.06.05 As soon as the ball has been projected, the server’s free arm and hand shall be removed from the space between the ball and the net. 2.06.06 It is the responsibility of the player to serve so that the umpire or the assistant umpire can be satisfied that he or she complies with the requirements of the Laws, and either may decide that a service is incorrect. 2.06.06.01 If either the umpire or the assistant umpire is not sure about the legality of a service he or she may, on the first occasion in a match, interrupt play and warn the server; but any subsequent service by that player or his or her doubles partner which is not clearly legal shall be considered incorrect. 2.06.07 Exceptionally, the umpire may relax the requirements for a correct service where he or she is satisfied that compliance is prevented by physical disability. 2.07.01 The ball, having been served or returned, shall be struck so that it touches the opponent’s court, either directly or after touching the net assembly. 2.08.01 In singles, the server shall first make a service, the receiver shall then make a return and thereafter server and receiver alternately shall each make a return. 2.08.02 In doubles, except as provided in 2.8.3,the server shall first make a service, the receiver shall then make a return, the partner of the server shall then make a return, the partner of the receiver shall then make a return and thereafter each player in turn in that sequence shall make a return. 2.08.03 In doubles, when at least one player of a pair is in a wheelchair due to a physical disability, the server shall first make a service, the receiver shall then make a return but thereafter either player of the disabled pair may make returns. However, no part of a player’s wheelchair nor a foot of a standing player of this pair shall protrude beyond the imaginary extension of the centre line of the table. If it does, the umpire shall award the point to the opposing pair. 2.10.01.13 as provided under the expedite system (2.15.4). 2.10.01.14.03 his or her opponent’s footrest or foot touches the floor during play. 2.10.01.15 as provided under the order of play (2.8.3). 2.14.02 If the players have not changed ends when they should have done so, play shall be interrupted by the umpire as soon as the error is discovered and shall resume with the players at the ends at which they should be at the score that has been reached, according to the sequence established at the beginning of the match. 2.15.01 Except as provided in 2.15.2, the expedite system shall come into operation after 10 minutes’ play in a game or at any time when requested by both players or pairs. 2.15.02 The expedite system shall not be introduced in a game if at least 18 points have been scored. 2.15.03 If the ball is in play when the time limit is reached and the expedite system is due to come into operation, play shall be interrupted by the umpire and shall resume with service by the player who served in the rally that was interrupted; If the ball is not in play when the expedite system comes into operation, play shall resume with service by the player who received in the immediately preceding rally. 2.15.04 Thereafter, each player shall serve for 1 point in turn until the end of the game, and if the receiving player or pair makes 13 correct returns in a rally the receiver shall score a point. 2.15.05 Introduction of the expedite system shall not alter the order of serving and receiving in the match, as defined in 2.13.6. 2.15.06 Once introduced, the expedite system shall remain in operation until the end of the match. For a regularly updated list, check out this page of table tennis rules.